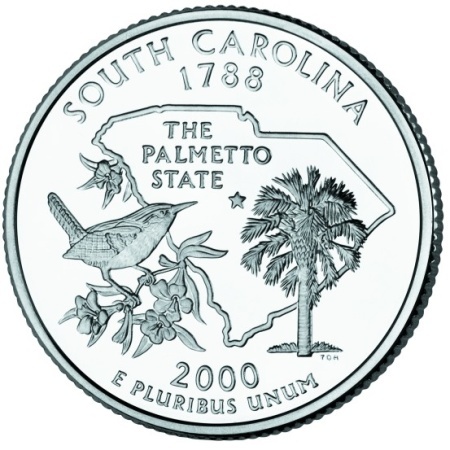 The South Carolina State Quarter was the third state quarter released in the year 2000 and the eighth in the series which was authorized by the 50 States Commemorative Coin Program Act. The State Nickname - "The Palmetto State"
The Palmetto Tree has significant meaning to the State of South Carolina. In 1776, during the Revolutionary War, colonists built a small fort with Palmetto logs and were successful in defeating the British fleet which was trying to capture Charleston Harbor. As a result, South Carolina has since been nicknamed "The Palmetto State". 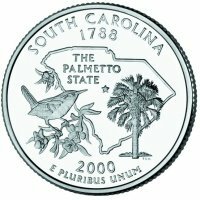 To choose the design for the South Carolina State Quarter, the South Carolina Department of Parks, Recreation and Tourism accepted submissions from school children, the South Carolina Numismatic Society and from within their own offices. Five semi-finalists were chosen from among the submissions which were then sent to The Citizens Commemorative Coin Advisory Committee and the Fine Arts Commission who narrowed the field down to three. Below is a table showing the design specifications and mintages of the South Carolina State Quarter. Note: The modification moved some of the wording from the reverse to the obverse to leave the reverse available for the state's design. Reverse - Each state theme was proposed, and approved, by the governor of the state. Final design was created by Thomas D. Rodgers. His initials appear just below the Palmetto tree.